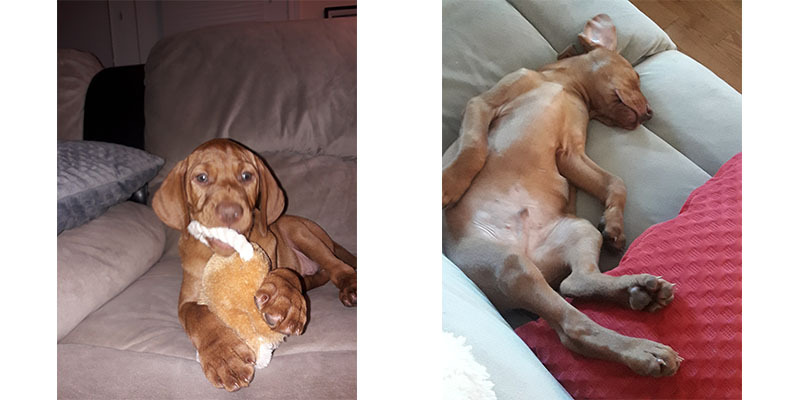 We regularly get updates on how our puppies settled into their new homes and many emails and letters describing the exceptional temperament of our vizslas. They’ve been impressing people all over the country! 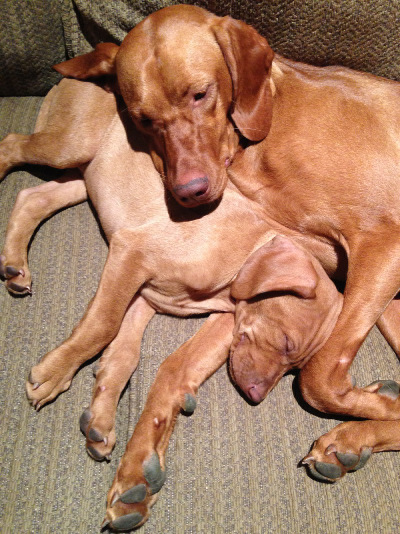 Here are a few updates from Bonneterre Vizsla owners. Bella and her human family send most cordial greetings and warm wishes for the coming New Year and Merry Christmas. Bella is a wonderful pup and growing up nicely. She is intelligent and cheerful, she is equally keen on playing, chasing squirrels, doing the “nose work”, pointing birds, and learning new tricks in her obedience classes. She is very active on her “social scene” in the dog park and knows how to stand her ground even with bigger dogs. 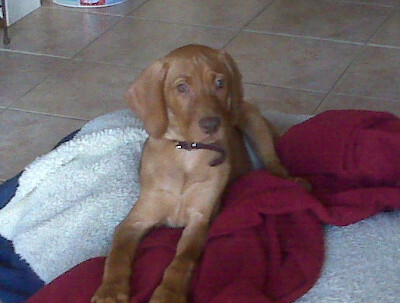 Bella is very cute and loving but at the same time confident and keeps herself busy with her toys. From the first day she sleeps very well in her crate, that gives us peace of mind when we leave for work. We love her dearly. 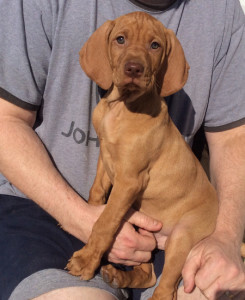 Bonneterre Africa Zeus X Busch’s Princess of Wales first litter puppy Vizslavilla Shiftin Gears (Shifty). NAVHDA prize 2 on Sept. 9/2017. Missed perfect score by 2 points, handler (me) error. We will be spending the rest of the year hunting and having fun going after wild birds and focus on training for CKC FD in the new year. Great puppy. Integrating well – he’s a big boy! 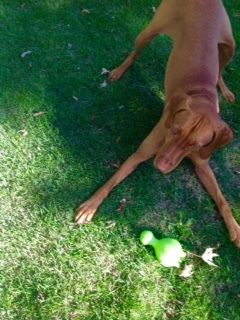 I just thought I would send you a quick email to let you know how Dakota’s first week at home went. He is a very social boy. He has had many visitors and is happy to see them all. His favorite place to sleep is the couch of course but he sleeps great in the kennel too. He has adjusted well to being away from his siblings and never cries at night. Unless he needs to go out to do his business. He mostly sleeps through the night and gets up when I get up for work. Royal has been a part of our family for almost 2 years… We were told by Ray that his dogs were known for there gentle personality, and he was right! Royal is an amazing dog who is so gentle with our 3 kids. He was super easy and eager to train from his first day home! We love our pup and we are ready for another! Here are a few more pics of Morley. He is the best dog imaginable. We are so lucky to live in the Beaches in Toronto where he can have the huge lakefront as his playground from November til April. I can rely on Morley to be polite and empathic with all the dogs and humans we meet on our adventures. His recall is 90 %. 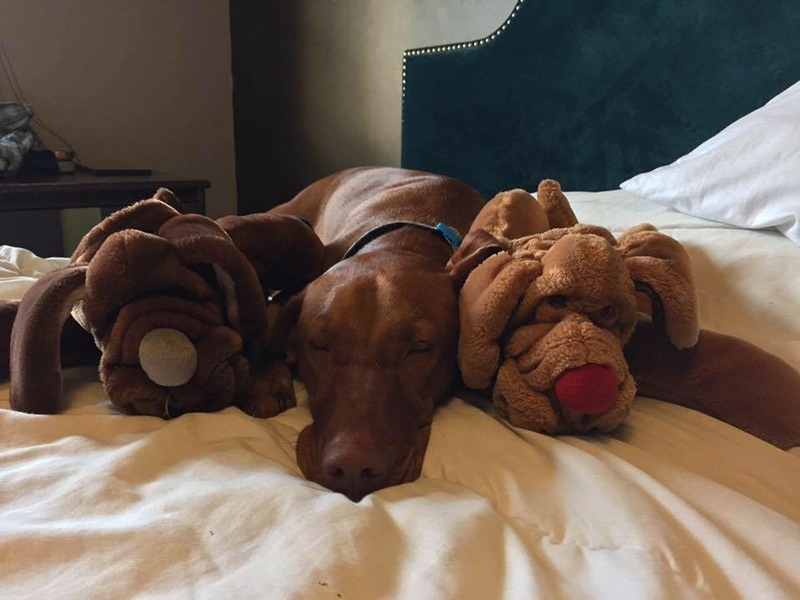 When he was 2, he went through a short lived stage of being impatient with very young puppies but now, at 3, he has matured and instinctively adapts his behaviour with young and small dogs so that he does not overwhelm them. He plays extremely well with Boxers, Dobermans, and Great Danes. 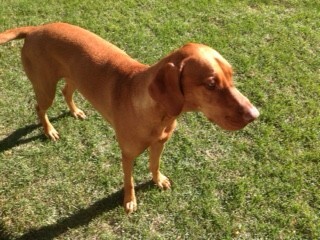 He is a treasured member of my running club and does extremely well as a running companion on disciplined runs. He adapts to the “pack” and follows instruction beautifully. I am hoping to bring a female V puppy into our family and will be in touch soon as to your litter schedule. Thank you for the joy your beautiful dogs bring to this life. Roscoe is just an absolute wonderful dog. Such a loveable breed. Thank you again…and many more for a wonderful dog. Here is our boy, 3 years old in March. He is a fabulous little creature: affectionate, stable, playful, polite, healthy and active! He is quite tall and weighs 65 pounds. He learns quickly and other than a little stubborn streak, listens and minds instruction well. He is known and loved in our neighbourhood and gets constant compliments on his good looks. Constant! I saw your picture on facebook today of the new Ocea/Zeus pup. She’s a beauty! Our girl, Amsterdam, is from the first Ocea/Zeus litter in 2012. Attached is a picture of her on a walk in the fall. She is the most loving, strong, wonderful dog we could imagine. She can hike all day long, and then fall asleep on your lap. It’s the best. THANK YOU! Caber, growing into his wrinkles and ears. We just wanted to send you a quick note to tell you how much we love Xander. We could not have asked for a better puppy. He has the greatest temperment of any dog we’ve ever had. He loves all things living…other dogs, our 2 cats, children, and adults, he is just wonderful. 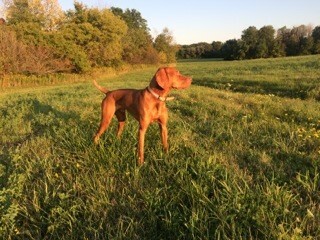 We started out just wanting a companion dog but we entered him into a field test where we were able to see and appreciate his amazing hunting and pointing instincts. He is only one leg away from his FDJ designation and we are planning on entering him in NAVHDA this fall. Thank you for all your help and support! 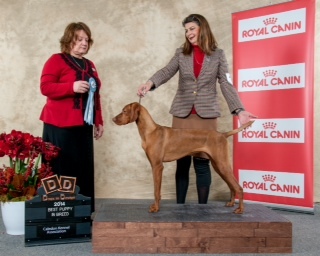 Baron finished his FDJ last weekend at the Brittany Spaniel Club of Ontario tests in Zephyr. He passed with a 94. He was spectacular in the bird field, pointing 3 birds within 5 minutes. He was steady to wing for all three. He only lost his marks in the control fields because he was a bit relaxed. So his three test scores were: 100, 89 and 94 (Average 94.3). Does CKC send us anything saying he is FDJ? Is there a certificate? I have attached a picture of Baron pointing the third bird (at 15 yards). I just want to let you know that Daxter has settled in very nicely. He’s perfect! I must say that you did an excellent job in picking Daxter for our family. 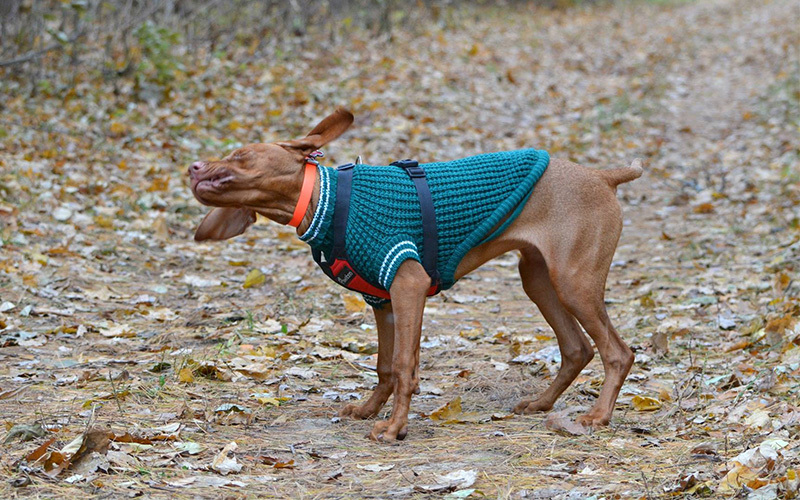 As novice pet owners we really didn’t know what to expect, but our little vizsla is so eager to please us that training has been very easy. By the way, he has complete run of the house (I know against every-one’s advise) but he really seems to understand that certain parts of the house are off limits- he only goes to the forbidden zones when he wants our attention, and then he squeaks a toy so that we know he’s there. 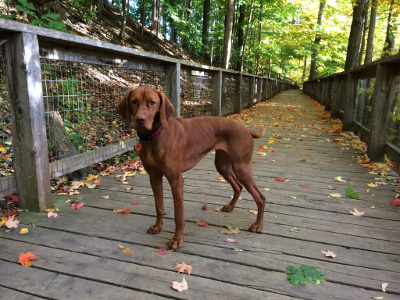 Our vet says that Daxter is healthy and a good looking vizsla (she has several vizsla’s in her practice from other breeders, but they aren’t as pretty.) Daxter is a pleasure to walk, he came well socialized. He plays with all our neighbours’ dogs and he’s not afraid of people. He also would love to chase bikes and cars, but he’s learnt to sit instead, tail thumping. He can’t resist my son’s skateboard and has actually tried riding it, much to the amusement of guys in the skateboard park. Daxter and my son are the best of friends, yesterday I caught them cooling off together in the bath-tub water splashing in all directions. He’s also an avid digger- nothing makes our Daxter happier then digging in the sandpit at the local school-yard. He’s still very young (11 weeks), he’s pointing, unfortunately mostly at ants…..but he’s still learning! He doesn’t like to be crated. When we initially crated him he was like an opera singer, his vocal span and abilities were quite impressive. Now he gives us a few whimpers in protest, but remains calm and sleeps until we let him out. We love Daxter. I can’t imagine our life without him. Thank You so very much for such a wonderful puppy. 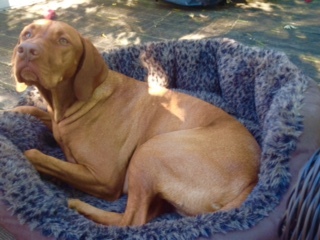 Just thought we would send you a picture of Benson, he is a great boy. He is sitting on the couch beside me right now with his Nylabone….he has had his shots a couple of weeks ago, and the vet said he looked good. He was house broken in the first week, is coming, sitting, and off on command of course with the help of some treats…. he sleeps in his crate at night and stays in their a few hours at a time when we have to go out…. ( Ana’s parents live down the street and have been helping out if we are more than a few hours out) we love this little guy so much – he is wonderful. He is very social and loving to all visitors, he’s been getting good exercise everyday with dad, and we have a private obedience trainer coming in this week – he will start phase II classes with a group in January. He looks really good as you will see in the picture – I think he is going to be a good size male. Hope you are well, and feel free to drop in and see Benson any time you are in Georgetown. 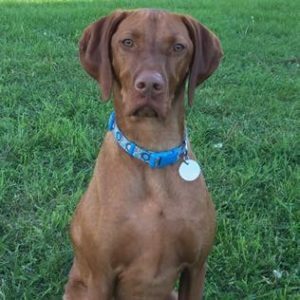 At age 14 months, Rusty was sent to Elliott’s Training Kennels in Knoxville, Tennessee, U.S.A. for a period of three months to be trained as mantracker. Mr. Elliott was a little hesitant as he had only trained German Shepherds, Dobermans, and Rottweilers. Mr. Elliott stated, “Not all dogs can stand up to the rigorous training and discipline. 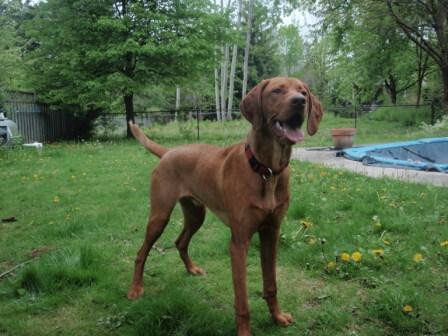 Three months later when Rusty graduated, Mr. Elliott rated him as one of the best to be trained at his kennels. While at the Kennel being trained as a mantracker, Mr. Elliott also tried him at sniffing drugs and he passed with flying colors. In December, 1981, the Pennsylvania State Police and the Pennsylvania Game Commission requested that Rusty, perhaps could find a deer hunter that had not returned from the woods. This hunter was reported missing at 3:00 pm, and search parties searched for him until 12 o’clock midnight without any luck. Rusty was then called. He was put on track with only the smell of the hunters shirt, which his wife had brought from home, that he had worn the previous day. At approximately 1:00 pm, Rusty started tracking the lost hunter. Six hours and approximately 10 miles later, the missing hunter was found dead. Rusty and his owner-handler, and a park ranger had worked tirelessly tracking this hunter. All were thanked for a job well done, but most of the thanks went to Rusty, and he loved all the attention. 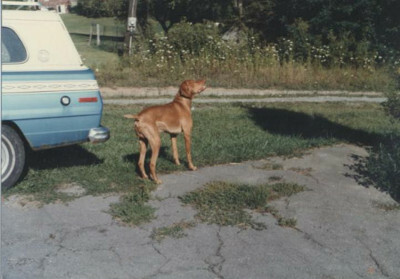 In May 1982, Rusty was used by the Beaver County Sheriff’s Department to track an armed robber. The armed robber held up a business in a local shopping plaza. He ran and subsequently stole a car. He preceded down the highway and eventually abondoned the automobile 10 minutes later near a heavily wooded area. The Sheriff’s office immediately called for Rusty to track the fleeing felon. The only scent Rusty had to go on was teh seat and the gas pedal of the stolen automobile which the robber had been in for only 10 minutes. He tracked this robber through the woods, up a mile high steep hill, over a golf course, through another area of woods and into a town. He lost the trail in town where the robber was picked up in an automobile by an accomplice. This trail covered about six or seven miles. With Rusty’s help they were able to locate and apprehend the robber in the town not far away. In November 1982, Rusty and his owner-handler were called to patrol an area where a bomb had exploded and several tons of explosives still on the property were sniffed out by Rusty. During the summers of 1981 and 1982, Rusty was used to patrol the Fair Grounds with his owner-handler. Rusty is also an Honorary Deputy Sheriff and has his own badge.